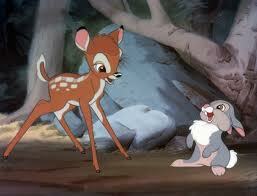 “If you can’t say something nice, then don’t say nothin’ at all!”, says Thumper, Bambi’s little rabbit-friend. I think he was on to something. I have struggled with gossip for many years. In high school, I almost lost a friend because of some words I said to someone else that got back to her. She forgave me, but I learned a valuable lesson. Ever since then, I have tried to be extra-vigilant when tempted by an opportunity to say something negative, hurtful or otherwise “gossip-y” about someone else. Maybe you have been on the receiving end of gossip, as I have. If so, then you know how very unpleasant that can be. Even if what is being said is mostly untrue, just knowing that someone is out there saying negative words about you leaves you feeling violated. When our hearts are filled with strife, we cannot help but spew negative words. God also gives us a remedy, to continually fill our hearts with the Word of God! In order to avoid the trap of gossip, whether it be at the office, among friends, or in our families, we must continually remind ourselves of the words in these scriptures. In addition to the Word, my husband has been a tremendous source of encouragement for me when I am in a situation such as the one I am encountering at work. He offers himself as a sounding board for my frustrations, then gently reminds me that an awesome task has been set before me at work, and I must not do anything to jeopardize it. Even if I don’t always agree with everything my boss says or does, he is still the boss and I have to respect that. Although my work as a non-profit professional gives me a great deal of satisfaction, I have to remember that I’m not doing it to massage my ego. In I Corinthians 10:31(b) Paul tells us, “whatever you do, do all for the glory of God.” In this instance, God has instructed me to keep my head down, do my work, and do not participate in the gossip (as tempted as I am)! Proverbs 5:1-2 My son, give attention to my wisdom, incline your ear to my understanding; that you may observe discretion and your lips may reserve knowledge. Proverbs 6:2-3 If you have been snared with the words of your mouth, have been caught with the words of your mouth, do this then, my son, and deliver yourself; since you have come into the hand of your neighbor, go, humble yourself, and importune your neighbor. Proverbs 12:19, 22 Truthful lips will be established forever, but a lying tongue is only for a moment. Lying lips are an abomination to the Lord, but those who deal faithfully are His delight. Proverbs 13:3 The one who guards his mouth preserves his life; the one who opens wide his lips comes to ruin. Proverbs 17:27-28 He who restrains his words has knowledge, and he who has a cool spirit is a man of understanding. Even a fool, when he keeps silent, is considered wise; when he closes his lips, he is considered prudent. Heavenly Father, thank You for the instruction that You provided us in Your Word. As we seek to fill our hearts with Your words, continually remind us that our words, like Yours, have great power. Help us to uplift and not hurt, to edify and not berate. Put a guard on our lips so that we only speak words of life. In Jesus’ Name, Amen. Scripture: Proverbs 12: 4 ”A wife of noble character is her husband’s crown, but a disgraceful wife is like decay in his bones. When a bride walks down that aisle in white gown and veil, she is certainly not planning to become a disgraceful wife who brings decay to her chosen husband’s bones. From the moment they walk blissfully out of the church as newly Mr. and Mrs, his handsome body begins to decay as she leeches the vitality and life out of him? No,that is not at all what she has in mind when she says “I do”. She is thinking about a “Leave it to Beaver” life with her perfect man in a perfect house filled with wonderful children and a dog or cat to boot. Let’s be honest. That’s what we were dreaming when we got married, right? At least I was. But let’s face it. The years pass, reality sets in. Those vows we pledged at the altar get put to the test. Proverbs 31: 26 says, “When she speaks, her words are wise and she gives instructions with kindness.” OUCH! Wise? Kindness? Well, perhaps our instructions sounded wise and well thought out, but were they spoken in kindness or just shouted out (or growled under our breath) as frustration got the best of us? What kind of crown have I been upon my husband’s head? An ornamental wreath of dripping anger or a crown so tight it gave him a perpetual headache? Did I sit slightly off kilter like a jester’s hat? It would be wonderful to think that I sat like a royal crown, that I presented myself as completely worthy and honorable, that by my mere presence I could bring him success and honor. We wives all like to think that we have been an asset to our husbands, but in reality, the crown we often represent has missing jewels. Tarnish has made it ugly. So much so, that maybe he would like to send that crown to the repair shop or just stick it in a box somewhere out of sight. To get back on track as a wife that is worthy, the one we actually long to be, we need perhaps to polish or replace those missing jewels. But how to polish away that tarnish? It isn’t easy, nor always successful. It’s a maintenance job that requires continuous attention, and one that we usually cannot accomplish alone. Sometimes we don’t even see what repairs are needed. We just know there’s a problem. But that in itself is the first step to repairing the damage. Seeking counsel from the Lord, or God’s people, helps us gain self-perspective, which leads to change. What an inspiring goal for us wives to aspire to! We are his helpmate, not his mother or jail keeper! Most of us desire to bring out the best in our husbands, even when we’re not sure how to do it. The daily prickles of our relationship get in the way of the best intentions. So when is the optimum time to polish our crown and jump right in? When our car is broken down, and we are now without a vehicle, or worse yet, finding ourselves stranded along the road after we had just told him last week that the car needed attention? (You know what I mean. The car made that funny noise that you just knew was not good.) Or how about when you two are out in the boat and you ask him to take you in because you’re feeling sunsick, but his priority is to catch the “big one”, so now you’re stuck in the boat for the duration? I don’t know about you, but I don’t find that I am inclined to be a wife of “noble character” in such situations. However, if I pay attention, I am bound to find the perfect time to give him a word of thanks, a compliment, his favorite meal, some uninterrupted time to himself, or some extra “sugar”. Marriage has a continuous learning curve for both spouses. Some days it’s rewarding to be that shiny crown. Other days, when he “just doesn’t get it” (you know what I mean), it doesn’t seem worth the effort. But in reality, I don’t believe that very many women would want to harm their mate. Most of us truly desire to see the best in our partners and want the world to see him that way too. I believe that to approach my husband as a woman of noble character and to bring him good all of his days, I need to step back and take “me” out of the equation. It’s not about me. It’s about how I impact others - in this case, my spouse. Sometimes it requires a soft glove approach. Other times it means firmly speaking my mind and then trusting him with the outcome. How you respond to God’s instructions regarding being that crown on your husband’s head requires prayerful behavior. Purposeful choices that you might find rub your fur the wrong way, rather than spitting out your gut reaction in a situation, go a long way to building your husband up. Isn’t it good that most of us get to start over every day, putting our best foot forward? It’s even better when we seek God’s wisdom throughout the day - before there is a crisis! Don’t you want to be greatly praised? Don’t you want your husband to “praise you in the gates” as it says in Proverbs 31? Nothing will motivate our husbands to praise us like following God’s precepts for being the crown on our man’s head.